Earlier this summer when we were still on the Rock n Roller coaster tour across America I saw that The Pretty Reckless were having a pre-sale for their upcoming tour and if you bought them you would get a free download of their upcoming new cd, Who Are you Selling For? A couple quick clicks and we had our tickets before I even told Michele. We would be spending, what, 500 bucks for a $25 dollar show? I tried to justify it at first saying we would also go to the Seahawks game on Sunday night but I quickly found that tickets to the game were 250 minimum for the cheap nosebleed seats. After classes Thursday night at UAA we checked into the Inlet Tower in Anchorage that we booked online for $55 and had dinner in the bar. It was surprisingly good except they put mashed potatoes on the burger. Who does that, anyway? We had to be at the airport by 5 am so it was a quick night. We were right on time being that almost a foot of snow fell in the last 24 hours. In most cities a foot of snow in a day would shut the city down. We were wearing tennis shoes and sweatshirts. The flight to Seattle is rather quick, less than 3 hours. I worked on schoolwork with Michele. We arrived in Seattle and got our requisite rice burner rental car, this time a Nissan Versa. It was so small compared to our trucks at home and it always takes a little adjustment. We found our way to the motel and were told we couldn’t check in until 3:30 so we went to the Jack in the Box! Yep we get excited about things we don’t have in Alaska. Remember rabid readers when I told you that there was a four hour wait at the Olive Garden when it first opened in Anchorage? We went shopping at the mall. Compared to the ones in Alaska that opened sometime when Kennedy or Johnson were in office, we were inside a huge commercialization of wanton wasteful consumerism. I found a “deal” I couldn’t pass up, a $150 puffy at the Oakley Store. I have to fit in here in Patagoniaville and besides; Michele said my friends at school will be jelly. Michele bought a couple things for the kids for Reindeer Day and we were out of there in a flash. 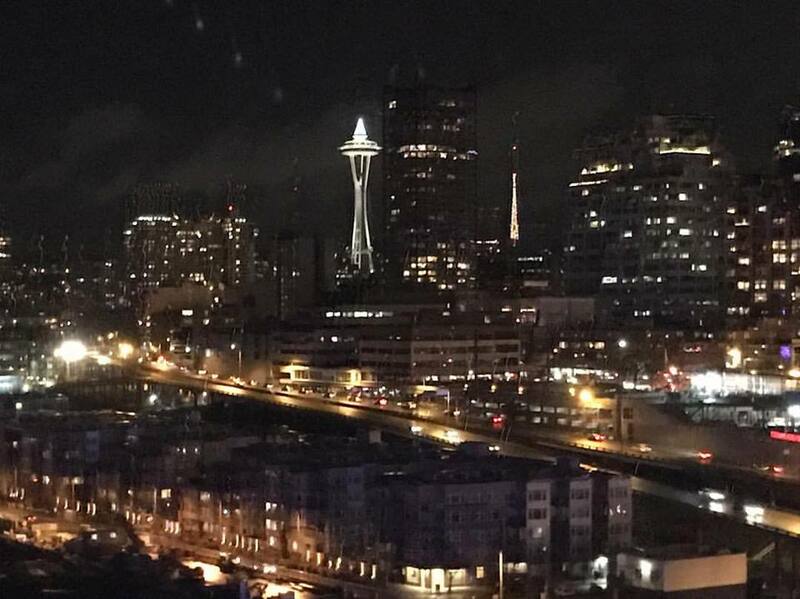 We checked into the room and I caught a quick 15-minute nap while Michele “freshened up.” We headed toward the Emerald City just as it was getting dark. Traffic is atrocious in Seattle, some of the worst in the country. We snailed our way to 1st Avenue toward The Innkeeper for dinner. The restaurant is a Caribbean Latin fusion and has a funky grunge vibe. The carne asada I had was great. I was living on the edge as I don’t usually eat spicy stuff but I have been stuffed up with an allergy fit for the past 67 hours that eating poblano peppers and cactus slices on tortillas was a welcomed meal. Michele had a tasty pomegranate vinegar salad with shrimp skewers on top. We thought we were close enough to walk to the club but it was all the way across town. The concert was at the legendary Showbox Theater right next to Century Link and Safeco. We found a table and got a couple rum and Cokes. We spent the next hour talking to a couple from southeastern Washington and waited for the gates to open for the floor. The venue is intimate. It only holds about 1000 people. The gates opened 7 and we found a place against the barriers about halfway back. The first band, Them Evils was very good. They sounded to me like a mixture of Led Zeppelin and The Black Crowes. They played for about 45 minutes and ended their set with an excellent cover of Motorhead’s Ace of Spades. RIP Lemmy. The next band was some punk-alt fusion trio from Des Moines. Who in the heck gets “discovered” in Iowa? The played their one-hit-wonder, Switchblade and interspersed their hour long set with Yosemite Sam, Maury, and Forrest Gump impressions and of all things stand-up comedy! Who tries to tell jokes at a rock show? 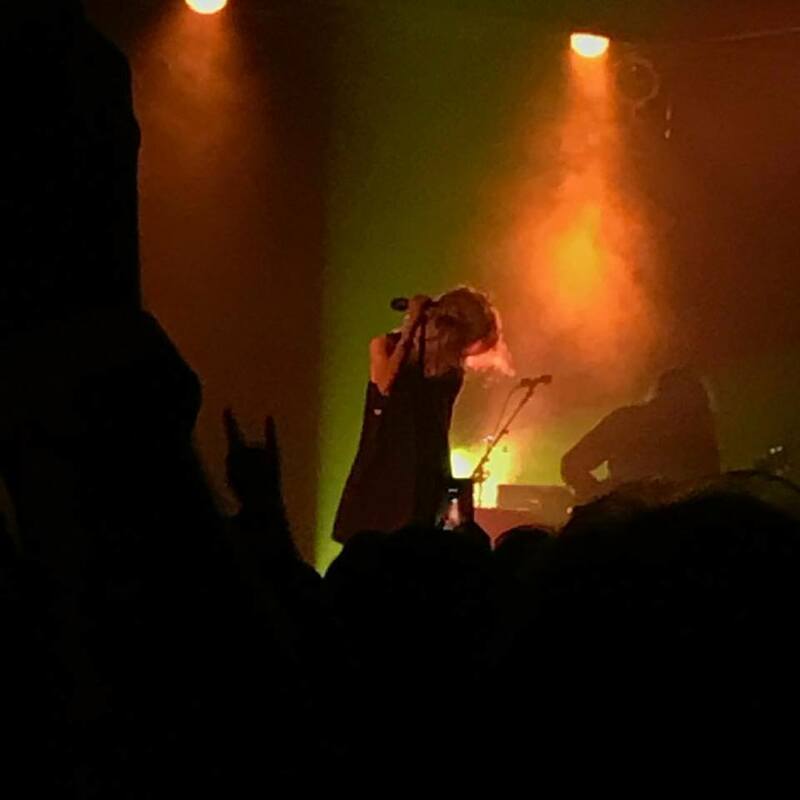 The Pretty Reckless came on stage at 10 and immediately started rocking the house with a song off of the first CD, The band came on stage after some warm up music from The Who, AC/DC and Aerosmith. Taylor’s trademark blonde locks were in her face and the guitars started screaming. They opened with Follow Me Down. The next one was Factory Girl. This song was written when she was just 16. For the first 3 or 4 songs, Michele was jammin’ enjoying herself in the pit. We usually get seats, but this was an intimate venue so I knew at some point she wouldn’t be able to see. Sure enough a group of lumberjacking, flannel wearing giants meandered over and stopped right in front of Michele. I immediately got the LOOK! After two more songs, Michele did something I didn’t expect, she moved! She placed herself about 20 feet from the stage, near the stairs for safety of course and then motioned for me to stand behind her. It was a great set. I can’t believe that I knew all the songs. Our daughter says its little weird that I am a fan of this band but it is the type of music I listen to. Taylor’s raspy voice and blues inspired growl is reminiscent of Stevie Nicks. They ended the set by playing the fan favorites of the new track Take me Down, a creepy Sweet Things and Heaven Knows that everyone was screaming the lyrics too. The band came back for an encore and after an awesome drum solo, played F****d Up World to end the hour and 20 minute set. I don’t know about Michele but I loved it. It is not in the same class as the ultra-staged Rob Zombie show or the huge, mega budget ultra rockers Guns n Roses who we saw just next door to the Showbox a couple months earlier. This was a show that makes you think of all the music history in this town from Jimmi to Kurt. Saturday morning we woke up early and headed over to Skillet in Capitol Hill. 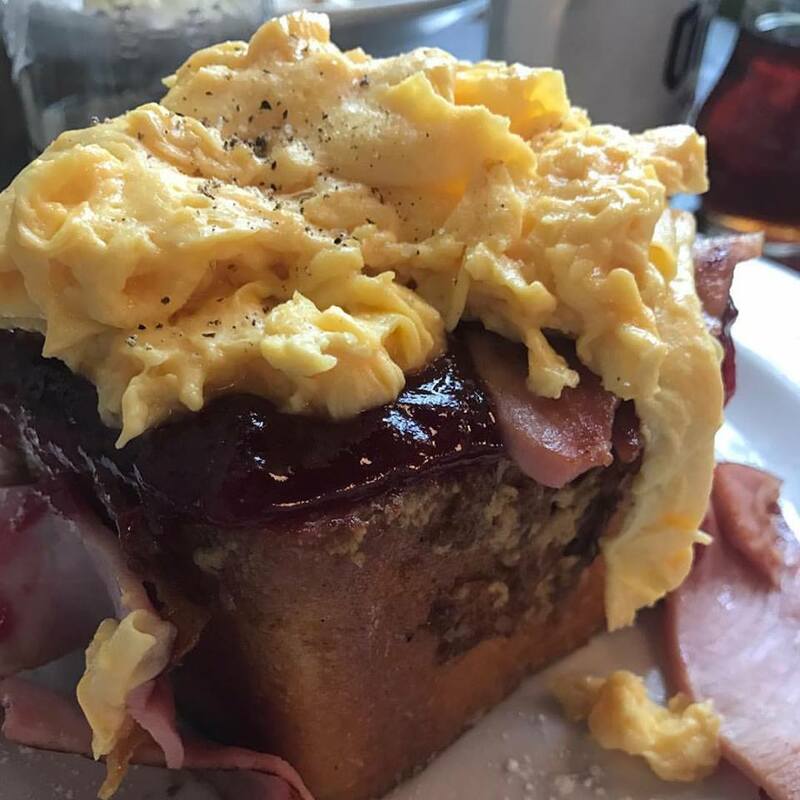 We had an excellent breakfast, Michele had the Serious Toast, a massive piece of molasses crusted French toast with eggs, jelly and ham. I had a very good biscuits and gravy. 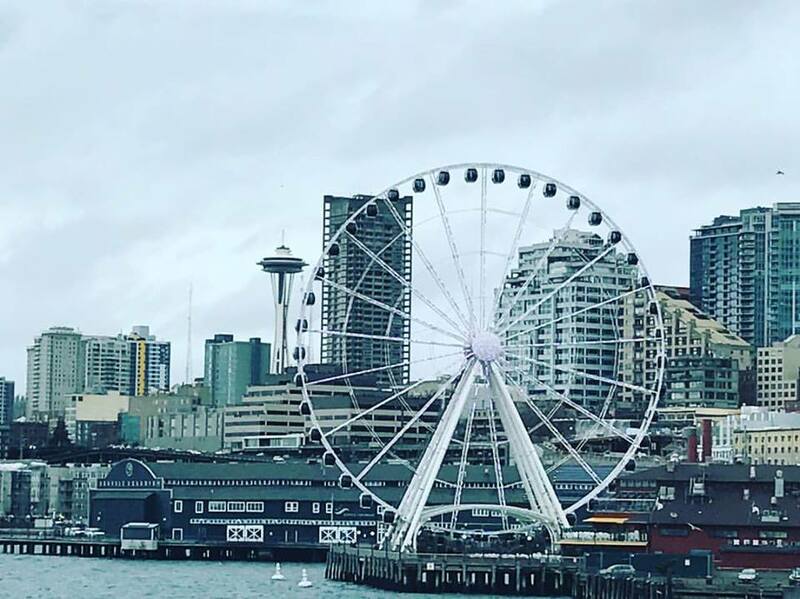 We then did something that was new to us both and decided to take a ferry across the sound to Bainbridge Island. The ferry was very cool! It is huge. It has a restaurant, a bar, lots of seating and a sun deck to catch some cool shots of the city as we flew by. We spent the afternoon exploring the island and browsing the shops. Christmas was in full swing and many people came over from the city to shop and dine at the unique eateries and bars. We drove around the island and Michele looked at real estate. She wants to retire here. Who wouldn’t! We travelled back across the Sound. It was dark by now and we did a little Facebook Live video on the request of a friend in the UK. The ferry was packed with shoppers heading home after a long day. 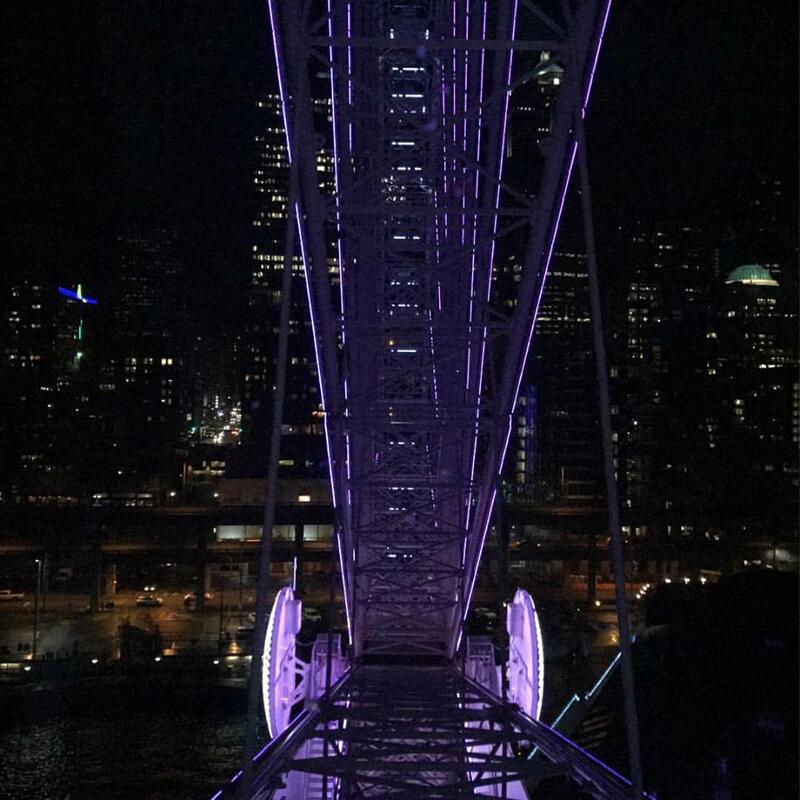 We decided to take a ride on the Great Wheel, a huge Ferris Wheel right on the water. There were spectacular views of the city from here! 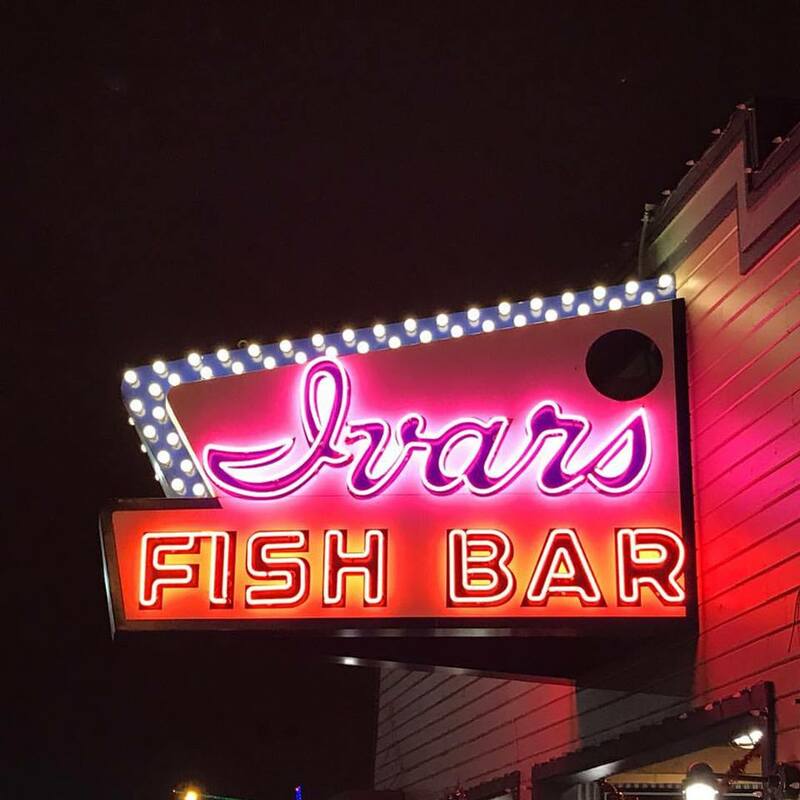 We had dinner at the famous Ivar’s. They have the best clam chowder known to man. I had fish and chips and Michele had bacon wrapped halibut that she said was one of the best things she has ever eaten. By Sunday morning we were on our way to Denver for work. We had our fun in the Emerald City and now it was time to get the job done, so to speak. We arrived after a bumpy flight at about 2 and rented a little pick-up truck and headed to the mountains. We were here to pick up Dutch, a German Shepherd puppy from our friend Jane who owns Rock Mountain German Shepherds. We have placed a lot of dogs from her over the years and if you are looking for a great companion this is the place. Next, we headed back down into the city to visit our son, Kyle. He just rented a new apartment in Littleton and had to check it out. We had an excellent dinner at Ted’s Montana Grill and caught up and told stories. Monday morning we got up early. Dutch had a great first night in the hotel room and lounged with us on the bed. We turned in the rental car and took the shuttle to the airport. Everybody loved the pup and training started for her right here. As we were checking in at the Alaska Airlines counter our flight to Seattle was cancelled just as our bags headed down the chute. Luckily we were still checking Dutch in or she would be flying by herself to Alaska. With our bags headed home we had to spend the next 6 hours in the airport. With Dutch by our side Michele and I caught up with paperwork and schoolwork. It would be a night in Seattle, as our flight home doesn’t leave until 6 am. Without clothes or a toothbrush. What a night! It took us almost 24 hours to be on a plane for less than 6. We arrived in Seattle at 9:40 and had to get Dutch. We decided to stay in the hotel. That means we would have to take a shuttle. I had shuttles. We loaded her up the only place she would fit, the front of the bus and were checked in by 10:15. We caught the last half hour of the Victoria Secret Fashion Show. How could it not be Christmas without some half naked angels? We were up at 3:30 and back on the shuttle at 4:15 for a 6 am flight. 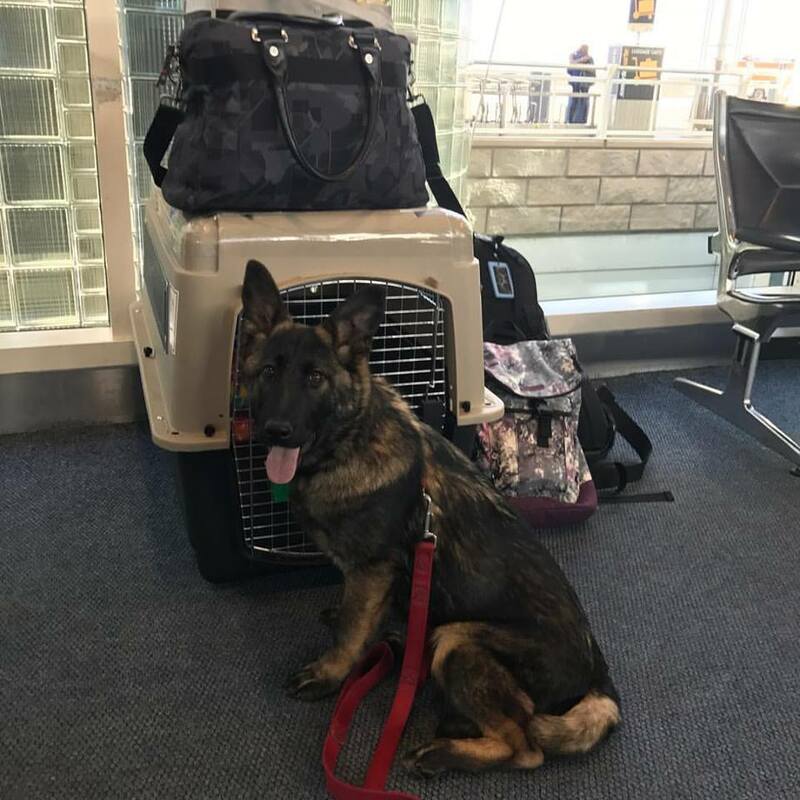 It took some time to get Dutch checked in and by the time we arrived at the gate they were already boarding. This would be the second flight in a row where I was stuck in a window seat. Last night I was wedged against the window beside a large lady with facial hair. At least this morning it was Michele. I tell you what, I don’t care what it costs or what time the flight I vow to never sit in the window seat again! Back home in Alaska by 9 am and just in time for an all day session of classes at UAA. We have our final lab exam in anatomy and physiology tonight at 7. We will finally be home at midnight. Can’t wait!